How can an elbow compression sleeve aid in preventing injuries such as tennis elbow and golfers' elbow? By utilizing the latest in compression technology, the Elbow Helix is able to provide superior injury relief and protection during activities as compared to a traditional bandage. 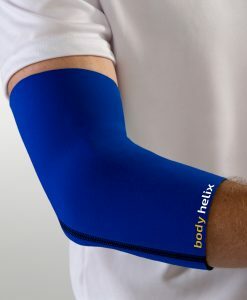 Our elbow sleeve is designed to provide consistent and comfortable medical-grade compression during activities, allowing it to act as an effective tennis elbow treatment. Moreover, the elasticity of the Elbow Helix elbow support allows it to fit comfortably on your arm while still providing a complete range of motion, making it practical to wear during physical activity and aiding in the prevention of injury. We have products for the entire arm including bicep wraps and wrist wraps. What is tennis elbow and how can a tennis elbow band help relieve its symptoms? Tennis elbow occurs when you have tendonitis – inflammation of the tendon in your elbow. As the name implies, it affects tennis players frequently but can also affect anyone who plays sports or other activities that require explosive, repetitive activities such as golf, racquetball, fencing, or weight lifting. A compression wrap offers multiple solutions for injury treatment. By providing firm, evenly-applied compression to the elbow and attached muscles and tendons, the Elbow Helix provides relief to tennis elbow sufferers helping to reduce pain.